Marillyn and James Hewson on the field at Bryant-Denny Stadium at The University of Alabama. 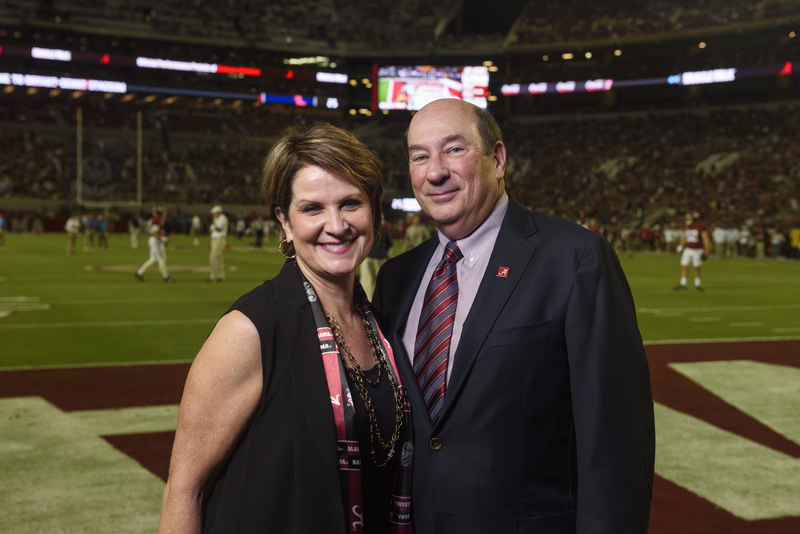 TUSCALOOSA, Ala. — Marillyn A. Hewson, chairman, president and CEO of Lockheed Martin Corp., and her husband, James, have made a gift of $15 million to The University of Alabama to benefit the Culverhouse College of Business. The gift is the largest one-time financial contribution in the University’s history. This contribution follows the $5 million commitment the Hewsons made to the College last year to support the Marillyn Hewson Faculty Fellows Program in Data Analytics and Cyber Security, a high-tech Data Analytics and Cyber Security lab, and an endowed undergraduate scholarship and graduate assistantship. The Hewsons are both graduates of the University. Marillyn Hewson is a two-time graduate of the University with a bachelor’s degree in business administration and a master’s in economics. She is also a member of the Culverhouse College of Business Board of Visitors as well as a member of UA’s President’s Cabinet. James holds a bachelor’s degree in communications. The gift announcement comes the same day Marillyn Hewson is being honored in New York City as the 2018 Chief Executive of the Year by Chief Executive magazine. Details of the gift will be announced later this fall. It is subject to the approval of the Board of Trustees of The University of Alabama System. In addition to leading Lockheed Martin, Marillyn Hewson has served on numerous boards and currently sits on the board of directors of DowDuPont, the Congressional Medal of Honor Foundation, the Board of Governors of the USO, the board of directors of Catalyst, and the executive committee of the Aerospace Industries Association and The Business Roundtable. Hewson has been recognized as No. 3 on Fortune magazine’s “50 Most Powerful Women in Business” in 2017, a top 10 “Business Person of the Year” by Fortune and one of the “World’s 100 Most Powerful Women” by Forbes.